Ps in a Pod/Durham Ps, 2017, cast iron sculptures, each unique and approximately 110 x 120 x 100 cm. Created by Louise Plant. Commissioned by Durham County Council. Supported by Arts Council England and the County Durham Community Foundation. Cast in iron at Hargreaves Foundry, Halifax. 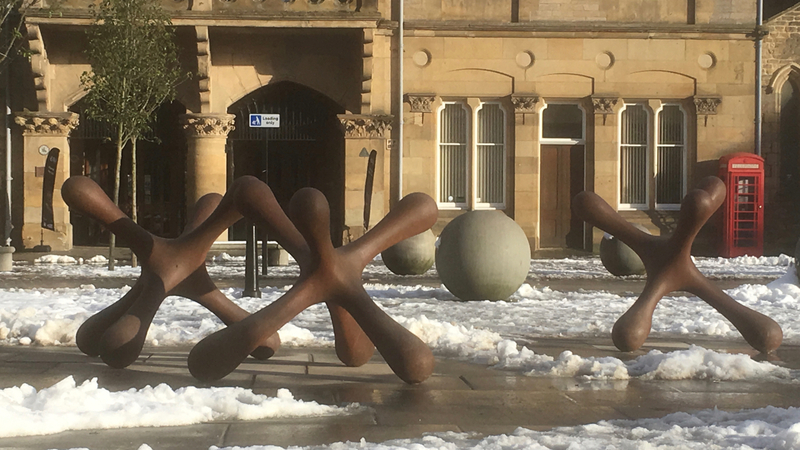 During 2017 – 2018, the cast iron sculptures are moving around County Durham. Previously sited at Noses Point in Seaham and Wharton Park in Durham, the Ps currently reside in Bishop Auckland’s Market Place. Next stop, Hamsterley Forest April 2018. There is a fascinating exhibition at Bishop Auckland Town Hall http://www.bishopaucklandtownhall.org.uk/whats-on/exhibition-ps-pod/ which shows the process of how the Ps came to life, starting out as sketchbook drawings, then plaster models in Louise’s studio and finally being cast from scrap metal at Hargreaves Foundry in Halifax. In the gallery you will find a film by Alan Fentiman, describing how Durham’s cast iron Ps were made. You will also find drawings and prints of the Ps, marble P sculptures and tiny P sculptures in bronze and ceramic.